Cap off your Cat6 custom cables with a 100 pack of Solid Cat6 RJ45 Plugs! 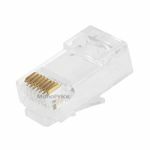 With shielding and stranded design that works with any Cat6 cable, this 100 pack of RJ45 plugs helps you make cables of any custom length.RJ45 connectors for Cat6 Solid cables. Cat-6 connectors are made to higher standards that help reduce noise caused by crosstalk and system noise. Crimp on RJ45 connectors with inserts for holding wires in place. Gold plated contacts Clear plastic housing. 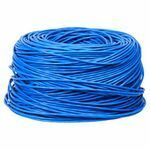 For Solid wire cables. Click the following link for an installation guide Monoprice continually strives to improve its product line to bring our customers the best products available. Therefore improvements and physical design changes may be made to listed specifications without prior notice. Item received may not match photo or specs shown. 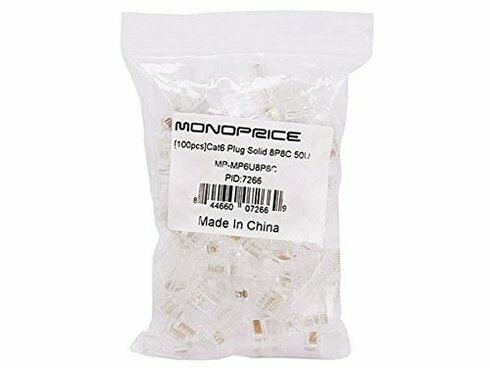 After trying to make cables using other plugs and failing miserably these ones are a life saver! Getting the individual strands to line up properly for cat6 without a guide or through hole plugs must take a lot of practice since i couldn't pull it off and i've made other types of cables in the past so i'm not a novice to this sort of thing. I used 24awg cat6 cabling and it's a fairly tight fit so i'm not sure if 23awg will work out well with these plugs. 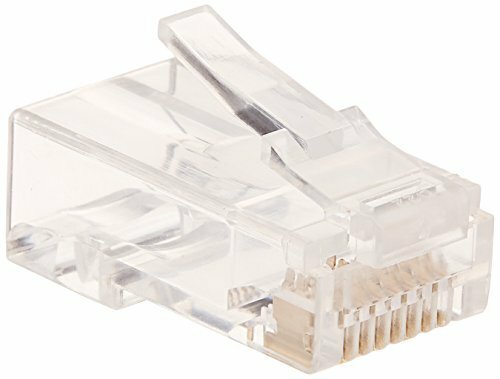 Here are my tips on using these:1) remove the outer shielding on your cat5/6 cabling and remove the pair guide in the center if you are using cat6 and above. Google search this further to see pictures of this step. Removing 1 to 1.5 inches should be plenty.2) put the guide inside the plug to figure out the orientation, then tip the plug over and let the guide fall out to make sure you push the individual strands through in the right order.3) insert the individual strands into the guide and pull them through as far as you can after all eight have been inserted.4) hold the cable + guide beside the plug to determine if you have pulled the strands through the guide far enough that the guide will sit right at the end of the plug when inserted. If it looks like it'll be snug skip to step 6.5) keep pulling the strands through the guide, you might need to use pliers to pull this off, go back to step 4 after.6) using wire split split the excess strands at the end of the guide perpendicular to the end of the guide (i.E. Split straight across to avoid crosstalk).7) insert the cable and guide into the plug.8) crimp the plug.9) repeat steps 1-8 for the other end of the cable and test the cable with a cable tester before inserting into any socket.In step 4 you are trying to get the guide to sit close enough to the shielded portion of the cable, so that the shielded portion sits snug with the retention indentation inside the plug that keeps the cabling from moving around inside the plug. I recommend buying plug covers as well to help keep the cable from moving around inside the plug. These were a pain to work with. The quality is decent but i took off half a star because it could be better and another 1.5 stars because the instructions could be more clear. It took me until the 7th attempt to get it right. Granted, for the first two tries, i didn't know i had to use the insert. Given that, i could say i got it right on the 5th try. What helped me get it right is the following:1. Straighten each wire as much as possible.2. Before inserting the wires in the insert, split them at a 45 degree angle. The shortest wire should be about half an inch long.3. Hold the wires tight and close together in the right order and slowly wiggle them into the insert.4. Push the insert as close to the jacket as possible.5. Trim off the excess wire at the other end of the insert.6. Insert the insert into the connect. It should go all the way to the end and the lip should fit with the lip in the connector. The insert should reach the end of the connector. If it doesn't, something went wrong. These are a little unique with the extra insert. 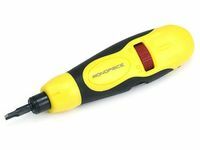 But once you learn to use them, they really are very easy to use and easy to see that the cables are inserted in the right position. I love them. Does the job. No complaints. These are an insert-type rj45. There is an extra packet inside that has the inserts for the plugs. 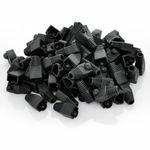 If you've never used this type before you can find a guide on the monoprice site; or just google it. 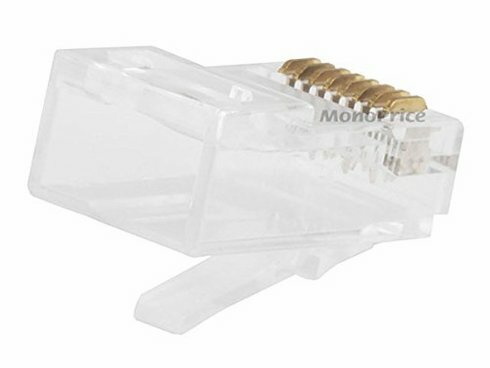 They are just as easy to use as the regular rj45. My only complaint is that i've had to bend the clips out a little to get them to latch right. That could be caused by the crimp though. Is this a normal cable tip? Does it have the plastic tab to release it from the port on the other side? Yes, this is a standard cable tip. It does have the release clip like a typical connector.